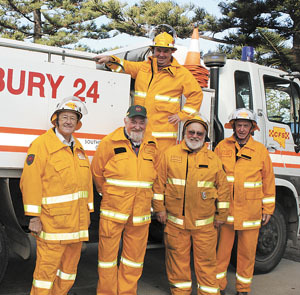 The Stansbury Country Fire Service brigade has the dubious honour of having the oldest average age of any station in Region 2 with the majority of its volunteers over the age of 60. The brigade currently has 10 active members on the books, the youngest 34 and the oldest 79, with 171 years of CFS service between them. But rather than think of themselves as a Dad’s Army outfit they say they have the advantage of passing on knowledge they’ve gained over the years to new recruits. Brigade captain, Scott Helmore, has been a CFS volunteer for 23 years, joining Stansbury after he moved to the Yorke Peninsula five years ago and, like the more senior members of the crew, is committed to keeping the station open. Stansbury Country Fire Service captain, Scott Helmore, aboard the truck, with members of his very experienced crew Kenn Rogers, Trevor Heard, Don Butler and Ron Anderson.